Yesterday we examined the record of Kurt Cobain’s childhood wanderings, how he was shunted from home to home throughout his teens. Finally relative stability arrived in the form of his first long-term relationship with Tracy Marander and a resulting departure from Aberdeen. That single residence on Pear Street in Olympia ended up being his home for just over four years, the longest he’d been in one place since he was nine years old though the couple did change flats within that building and Tracy did move out to be replaced as flatmate by Dave Grohl. Returning home in the aftermath of the recording of Nevermind, the move to a major label, standing on the cusp of his true fame Kurt managed to get himself thrown out for not paying the rent. That was the end of the stable spell of life. It’s genuinely fascinating realising that the rock star who ruled planet Earth for that spell in the early nineties didn’t have a home from July 1991 until January 1992; imagine it, the biggest rock star on the planet as living in his car. It’s curious, having arbitrarily made the start of Nirvana and of Kurt’s relationship with Tracy the dividing line between his youth and adulthood, that the pattern is much the same as his childhood with the stable period being superseded by yet another spell, this time of three years from age twenty four until his death, during which he lived in six definite locations and a slew of temporary accommodation. It’s an intriguing property because, despite the understandable attention paid to the site of Kurt Cobain’s death, it was the Carnation property that was the first home he owned and that was retained throughout the maelstrom of mid-1992 through 1993. It’s also mysterious because it’s impossible to tell how much time Kurt Cobain actually spent living at the house or why it seemed to be less than wholly beloved. For whatever reason retreating to a country village, one with a population of just 1,243 in the 1990 census, where Wikipedia lists the local activities available as “Harvold Berry Farm where you can pick your own berries in the summer”, doesn’t seem to have worked regardless of whether the idea was to evade drugs or intrusion in general. There is a rumour Kurt returned to the home sometime in early April having fled rehab. 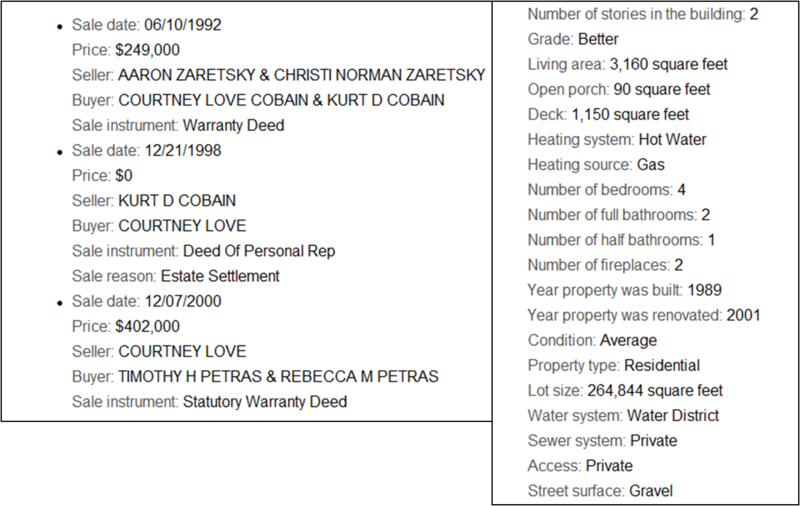 Working out the estimated dates of accommodation also throw Cobain’s relationship with his place of death into the spotlight. The Cobains moved into the Lake Washington house in January 1994. Nirvana toured until January 8. Kurt joined the band for their final studio session on Jan 30 then they left on tour two days later. He was in Europe until March 12 when he was definitely home given the Police were called to a domestic incident that night and again on March 18. He headed into rehab on March 30 returned home around April 3. At most Kurt Cobain lived in that house for three weeks in January, then just over two weeks in March. Of the 25 ‘phases’ identified, only five added up to more than a single year. Worse, of the years spent in solid locations, 13 ½ of those years took place from the age of less than one to only just fifteen years old. The remaining half of Kurt Cobain’s life, his entire rise to young adulthood, involved only the briefest of respites in which he had something that could be called a home.